Blue grama is a warm-season, native grass found throughout the American Great Plains. Along with buffalograss, this was the major native grass species of the short grass prairie. When grown together with buffalograss, Blue Grama usually becomes the dominant species when grown in sandy soils and buffalograss dominating with heavier clay soils. Blue grama lacks the creeping stolons of buffalograss and is sometimes grown as a specimen plant, allowing its thin blades to reach a mature height of up to 20" with a seed head that gently blows in the wind. 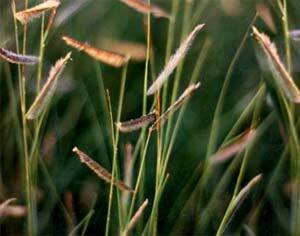 Blue grama possesses excellent drought and cold hardiness. 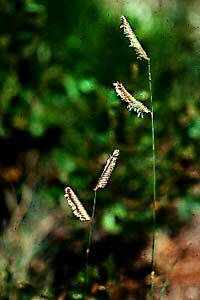 Although common at lower elevations, blue grama can be found at elevations approaching 7000' ? where warm-season species would not be expected to persist. Blue grama forms short rhizomes, but appears to be a bunch grass when seeded at low rates or when it is non-irrigated. Under favorable management, it can provide a serviceable turf of low to medium quality. Being a warm-season grass, it will be dormant for the majority of the year in northern areas of its range. Proper management is necessary to achieve reasonable turf quality. Excessive management, in terms of irrigation and fertilization, will promote weed and cool-season grass invasions. It is commonly planted for naturalizing for roughs of golf courses and where homeowners want a lawn that will not be mowed. Blue grama, with its accompanying seedheads, forms a very attractive unmowed turf. Blue Grama should be mown at 3" - 4" for lawns; unmowed blue grama will grow 10" - 20" in height. Excess watering / fertilization will accelerate weed invasion. Pre emergent herbicides labeled for use on buffalograss are safe for blue grama turf.